Going for the gold, gold medal, the golden rule, a golden anniversary. These are golden moments. 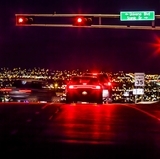 It’s the color that signifies the very best, the ultimate. The reality is, to reach the pinnacle of something, the pinnacle of everything, is to have reached the gold standard. For former Lobo and native New Mexican Brian Urlacher, Saturday, Aug. 4 was the day he reached the pinnacle of a football career. A career that began on a small field in Lovington, N.M., crossed over in front of tens of thousands of fans at the state’s premier football program at The University of New Mexico, and ended up on the biggest stage in the NFL with the Chicago Bears. Over that first weekend in August, Urlacher was formerly inducted in the Pro Football Hall of Fame. For reaching the gold standard in his sport, he earned the coveted Gold Jacket. And like everything he has done in the sport he loves, it was a perfect fit. 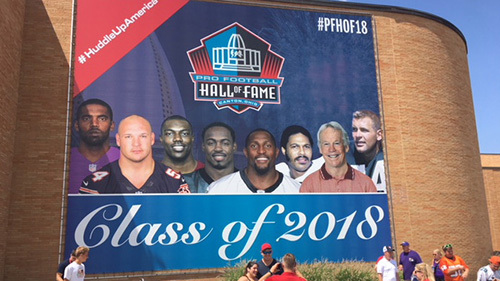 Urlacher is a part of the Class of 2018, along with Randy Moss, Ray Lewis, Brian Dawkins, Terrell Owens, Jerry Kramer, Robert Brazil and Bobby Beathard. 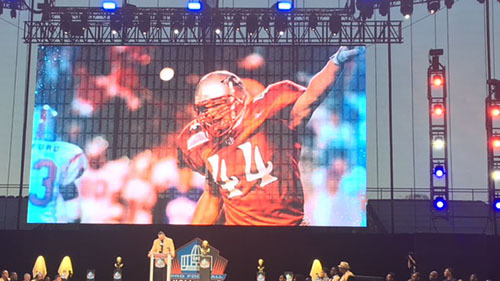 The Saturday induction ceremony was the highlight of The Pro Football Hall of Fame Enshrinement Week. The weekend started with the Hall of Fame Game on Thursday, Aug. 2 between Urlacher’s former team, the Bears, and the Baltimore Ravens. On Friday, Urlacher was officially presented his gold jacket at the Enshrinees' Gold Jacket Dinner, which was broadcast on the NFL Network. The weekend will finish on Sunday with the Enshrinees Roundtable and the Concert for Legends at Tom Benson Hall of Fame Stadium. The ceremonies rounded out an amazing eight-month stretch as he was enshrined in the College Football Hall of Fame on Dec. 6, 2017. That ceremony was in front of a packed house of 1,600, including more than 80 current collegiate head coaches and 40 returning Hall of Famers attended the event, which took place at its new venue after a 58-year stint at the Waldorf Astoria. 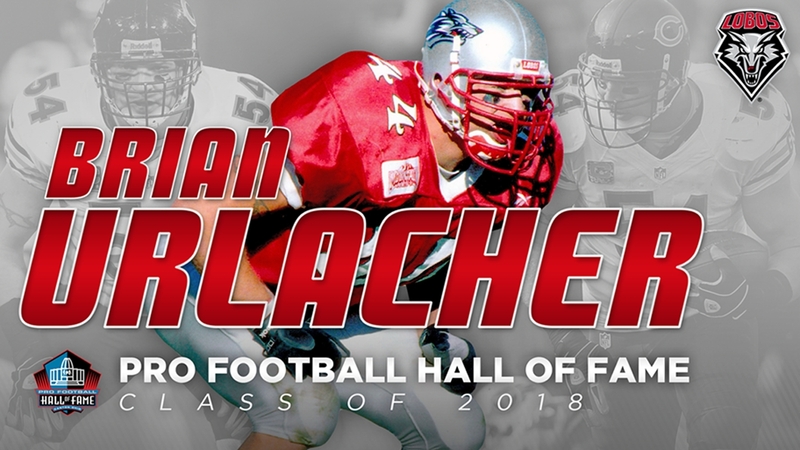 Saturday’s induction ceremony was in front of thousands of Urlacher’s fans, those from nearby Chicago, as well as many Lobo fans who made the trek to watch the first player with Mountain West ties, let alone UNM, to make it into the Pro Football Hall of Fame. 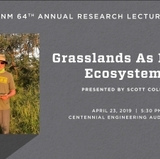 His brilliant collegiate career at UNM led to his selection in the 2000 NFL Draft, where he was the ninth overall selection, selected by the Chicago Bears. He would go on to have a brilliant 13-year career in Chicago, starting 180 of 182 games and setting a franchise record with 1,353 tackles, including 153 in 2002, which is still a Bears single-season record. He also recorded five touchdowns in his career along with 41.5 sacks, 22 interceptions and 12 forced fumbles. Among his NFL honors, he was voted to eight NFL Pro Bowls, was named the Associated Press and The Sporting News Defensive Rookie of the Year (2000), NFL Defensive Player of the Year (2005), and was named the Ed Block Courage Award winner for commitment to sportsmanship and courage (2012). He was a member of the 2000s All-Decade Team, and he was named First Team All-Pro in 2001, 2002, 2005 and 2006, and he was a Second Team All-Pro in 2010. Urlacher had a brilliant four-year career for the Lobos under Dennis Franchione and Rocky Long. Urlacher mostly played the hybrid "Lobo" back, which was a cross between a linebacker and a free safety. He played from 1996-99, earning All-America honors in both 1998 and 1999, including being named a Consensus First Team All-America in 1999 after one of the greatest seasons in Lobo history. 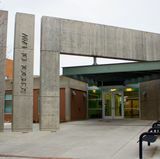 In 1999, Urlacher not only won Mountain West Defensive Player of the Year, but he was a three-way superstar, playing wide receiver and returning punts. Urlacher led the team in tackles with 154, with forced fumbles with five, with recovered fumbles with three, with pass breakups with seven, and then he also led the team with seven touchdowns, 42 points and with a 15.8-yard average on punt returns. Urlacher's senior season saw him advance as a finalist for the Jim Thorpe Award for the top defensive back in college football, and he finished 12th in the Heisman Trophy balloting that year. His final college game was in the 2000 Senior Bowl. Overall, Urlacher's 442 career tackles were good for fourth all-time at UNM, and his 11 forced fumbles are second. He also was a three-time WAC/Mountain West Player of the Week. In 2013, Urlacher's number 44 was retired, the fourth such honor to be given to a Lobo football player.